Amy was our wedding photographer. She guided us both through what we needed to do and made us feel really comfortable. In particular, she helped with a specific pose that I wanted on the day, which my husband was a little self conscious about. Amy was at our wedding all day and therefore we had loads of lovely pictures taken from when I was getting ready through to our first dance. So much so, I cannot decide which are my favourite for my album! Thank you Amy! We had never had a photoshoot before but Amy immediately made us all feel at ease and managed to amuse a toddler and a baby for long enough to get some beautiful pictures. She worked around us so that it felt effortless and nothing felt too staged. We had a great time and the resulting pictures are perfect! Thanks so much. Amy, thank you so much for a fabulous photo shoot. I was really concerned before the shoot but your patience dealing with the baby really put me at ease. I love the fact that you came to my home-I can't imagine having to take such a little baby out and probably wouldn't have made it! The whole morning was a pleasure and thank goodness for your props which made the photos uber cute! Cannot believe that the turnaround time was so quick too-I was so excited to see the pics and so grateful that the pics were available within 24 hours. I would not hesitate to recommend you to all of my friends and family and will defo be using you again in the future. Thank you so much! "Amy was extremely professional and made me feel at ease immediately. 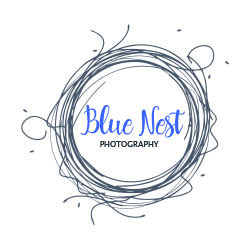 I would definitely recommend Blue Nest and my husband loved the personal gift!" "I booked Amy at Blue Nest Photography for an outdoor photo session with my two young children. I have ended up with far more great shots than I imagined and it was a totally painless experience - Amy is brilliant at engaging the kids and she has an eye for creating interesting shots that capture their personalities. I would recommend her without hesitation to anyone and I will be returning to Blue Nest myself for more family photo updates in the future. Thank you Amy!" "Oh my goodness, the photos for my business are fantastic! I am so happy with my pictures! Thank you Amy"
I asked Amy to do a boudoir photo shoot which was my wedding gift to my husband. Amy was very professional and made me feel very comfortable and relaxed. Amy guided me well with all of my poses and I was really pleased with the finished album and so was my husband! I wanted some portrait shots taken and so I asked Amy. It was really relaxed and we had a laugh which put me at ease. Amy posed some shots and also took some really natural ones. They all came out great and will definitely have more done soon! Highly recommend Blue Nest. I needed a very important picture for our website doing quickly and they gave us plenty of options and turned it around very quickly! Firstly David and I would like to say a huge Thank you to Amy for helping to make our day such a special one and for the beautiful wedding photos. You have created some stunning shots that take us back to the day each time we look at them. You’ve captured all the emotions, laughter and love perfectly. From the first moment that we met at the wedding fayre, we knew you were the one! So If you are looking for a photographer to capture the true essence and feeling of your wedding day, then look no further. Amy thank you again for your professionalism and the ability to set us at ease! You are now an official family member.